John Clarke, a comedian and political satirist beloved in Australia and New Zealand, has died at age 68. He's seen here in an undated photo provided by the Australian Broadcasting Corporation. His pitch-perfect parody of an Australian senator denying the impact of an oil spill once prompted a Snopes fact-check report. 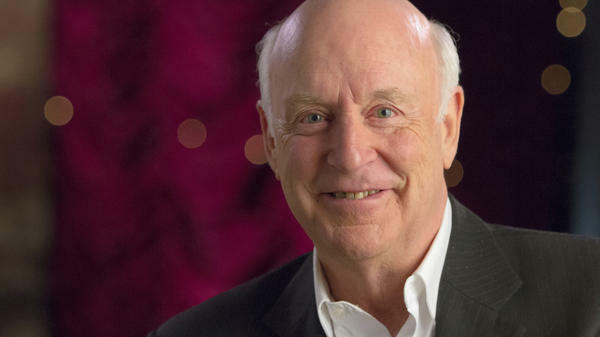 Satirist John Clarke, whose career spanned from 1970s sketch comedy to bitingly dry political humor, has died, leaving legions of fans in mourning. He was 68. Clarke died from natural causes during a walk in the Victoria bushlands over the weekend, reports the Australian Broadcasting Corporation, citing a statement from his family. Since then, tributes have poured in from around Australia and Clarke's native New Zealand. "We'll wait a long time to find another John Clarke. In fact, we never will," Australian Prime Minister Malcolm Turnbull said via Twitter. Clarke and his partner, Bryan Dawe, made up the Clarke and Dawe spoof-interview team, which had a long run on the ABC. They performed their "The Front Fell Off" oil spill sketch back in 1991. When a video of it was circulated online more than 15 years later, the sketch perplexed and amused millions of people, prompting Snopes to clarify that the pair were parodying reaction to an actual oil spill by a Greek tanker — which had indeed "lost its bow off the coast of Western Australia," as a government site notes. In 2010, the pair took on BP's U.S. oil spill for another sketch in which Clarke's character noted, "The first thing to do in an event like that is to underestimate the problem." Long before his turn as an Internet star, Clarke was a star in the comedy scenes in Australia and New Zealand. He wrote books and scripts; he recorded songs; he conjured up the sport of "farnarkeling" and covered it doggedly. "He came to attention in his native New Zealand in the 1970s when he created the iconic character, Fred Dagg, a country bloke dressed in a black singlet, shorts and gumboots. "He co-wrote the multi-award winning mockumentary The Games, about the Sydney Organizing Committee for the Olympic Games, which aired in 1999 and 2000." The character of Fred Dagg remains beloved and admired. Upon learning of Clarke's death, Jemaine Clement of the comedy duo The Conchords shared an early mockumentary segment featuring Dagg and his "approximately half a dozen" sons — all of whom were named Trevor. "So subtle and hilarious," Clement wrote. Actor and director Taika Waititi tweeted, "RIP John Clarke. Hugely influential to me and my mates, he was one of the fathers of NZ's style of comedy. We all copied him at some point."